Expertly extracted under strict quality standards and procedures from Arisaema Dried rhizome. We meticulously produce our extracts according to precise standards where each herb is extracted according to the distinct characteristics of each plant! Super concentrated Arisaema tincture: dry plant material / menstruum ratio is 1:3! Extraction rate: 1 ml of extract is equal to about 270-330 mg of Dried herb! Aloha inside! This extract really helps! Made in the USA, Hawaii in an FDA registered facility. Main ingredient: Arisaema (Arisaema Amurense) Dry rhizome. Origin: Russia. Menstruum: Alcohol, vegetable palm glycerin, crystal clear water. Contains NO: GMO, gluten, artificial colors, heavy metals, preservatives, pesticides, fertilizers. Suggested use and dosage for adults: Shake well before using. Take about 20-30 drops (1 ml or 1 full squeeze of the dropper bulb) to 2 oz of juice or water up to 4 times a day. - 32 oz jars may contain some plant material inside. - We DO NOT accept returns on 15x4 oz, 32 oz, 2x32 oz, 64 oz, 2 gal options. - Actual color of liquid may be different from the colour on the picture. Pleasant taste, soothing on throat. It takes a while for their products to arrive but quality is undeniable. I like the fact that their tinctures are alcohol-free. Thanks! Always quick delivery. Packaged very well. This seller has great customer service and ships it's items via Amazon Fulfillment thus it qualifies for Prime Free 2 Day Shipping! Item was as described and received it right on time. Only just started using it so don't know how it performs yet. I will buy from them again. This company was very responsive to changing the delivery address. They shipped the same day. this product is effective. I will buy again when i need more! Helps my very nervous horse! I don't remember ordering or receiving this product??? I have used other extracts you make, and like all of them. Did I order this? Anyway, thank-you!! Over the counter at CVS does the sane reaction on sleeping and cheaper. I've only used this for a few days now, but my sleep is deeper and more peaceful. Received well packaged and on time. Excellent seller. Item as described. Fast Amazon Prime shipping. Delivery was delayed due to UPS. Excellent Seller! Item shipped USPS from Honolulu, HI, to southern California in only 6 days from order date 3-11-2016! Order was correct and very well packed. Price was very good. Item was very fresh, expiration date 4-14-2017. 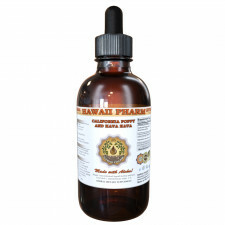 I recommend HAWAII PHARM and will definitely buy from them again. The tincture came pretty quick, especially since it came from Hawaii. It was wrapped up really well inside of a box. I will definitely be buying more from this seller, particularly because of the way it was shipped! Excellent Transaction! Item came more quickly than expected, packaged well. Exactly what i needed expected and wanted. I feel my health improving with use.. Great product! Arrived promptly and in excellent condition. This is the third time I order this item with same supplier. Wonderful product and service. Highly recommend. We needed the pure arnica for a particular application. Glad this was available and at such a low price!